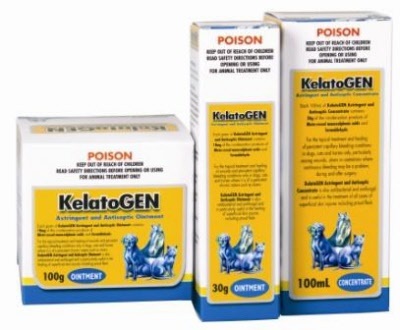 KelatoGEN is an astringent and antiseptic treatment for pre-existing or new wounds, external ulcers, abscesses, eczema, navel infection, bleeding oozing of wounds. KelatoGEN is also very effective in treating cuts and wounds with miraculous speed while preventing infection and promoting hair growth. Wire cuts, scrapes, punctures, cracked heels, saddle sores; rain rot lesions and bites heal quickly and more effectively with a reduced chance of scarring. KelatoGEN supports a healthy wound bed which accelerates healing for all wounds and is specially balanced so that it does not harm the surrounding healthy tissue. KelatoGEN is available in both a concentrate (100ml) and ointment (30g & 100g). KelatoGEN promotes healing in new and pre-existing wounds. Whether you discover the wound immediately or later, KelatoGEN can heal the wound at any stage. KelatoGEN reduces bleeding from wound capillaries when applied to small blood vessels to avoid a build up of dry blood on your horse and discontinue blood flow. KelatoGEN contains anti-bacterial and anti-fungal capabilities to create a powerful antiseptic preparation. KelatoGEN removes exogenous debris such as dirt and grease, and clears away all excessive debris from the wound to make the healing process more effective. KelatoGEN can be used on any superficial skin problem through to any serious wound. This versatility of KelatoGEN is due its extensive range of actions as well as the ability to dilute the concentrate as needed, depending on the severity of the problem being treated. Paint with KelatoGEN concentrate or irrigate with KelatoGENconcentrate at 10-20% dilution daily and continue treatment withKelatoGEN Ointment under bandage where necessary daily. Apply KelatoGEN concentrate at 4% dilution or apply KelatoGENointment under pressure bandage.